The website owner automatically gets notifications when his site is under a Negative SEO attack and if he receives lots of low-quality links in a short period he can easily disavow them in just a few minutes. When a site gets new backlinks or if any suspicious backlinks spam is ongoing, the owner receives an email report. Each backlink contain lots of metrics that help the owner analyze their quality easily. The owner can disavow any link or group of links with poor metrics with just a single click. The most common negative SEO attack is when a spammer points hundreds or thousands of spammy links to a competitor’s website in hopes to highjack their rankings in Google. Negative SEO attacks are a threat for business owners that don’t keep track of their backlinks. Without knowing when their site gets new links, they are at risk of becoming the next Negative SEO victim. However, that’s not the case for those that are smart and use the Monitor Backlinks tool and keep their rankings in Google safe. Automated, so site owners save time! 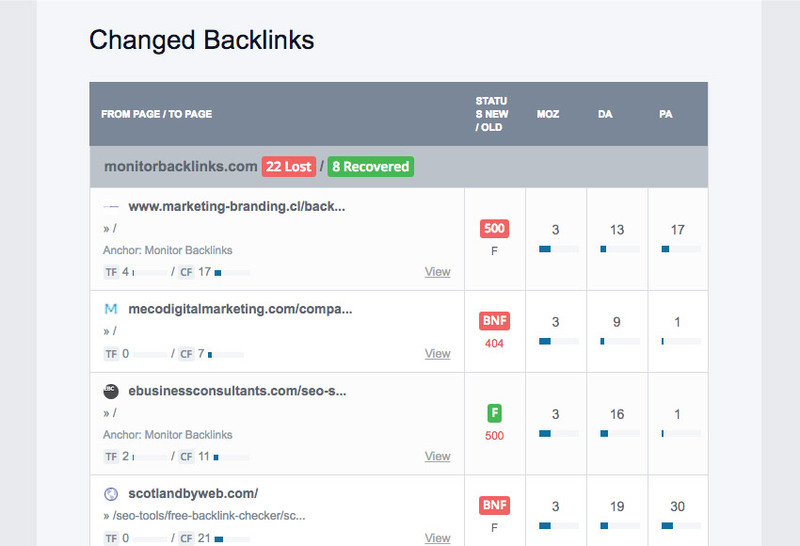 Monitor Backlinks is easy to use and was created to help site owners save time. All the necessary notifications are sent by email and inform the webmaster when they get new backlinks. If the links they received are inadequate, they can disavow them with a click of a button. Monitor Backlinks checks when a site gets new backlinks or if any suspicious backlinks spam is ongoing and sends email reports that look like the one in the screenshot below. Each backlink also includes metrics so that webmasters can see at a glance if the links are good or bad for SEO. 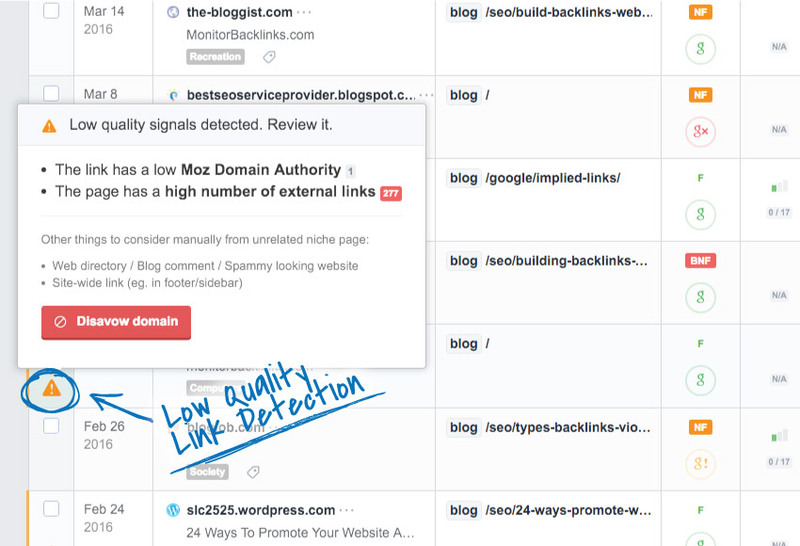 Monitor Backlinks automatically shows a warning sign for the links that have poor metrics. Any bad links created during a negative SEO attack can be disavowed just by clicking on “Disavow domain”. It takes a site owner less than 10 minutes to get rid of all the bad links a spammer created in days. Automatically check the status of each backlink every few days. Identify if the domain or page that's sending a backlink is indexed in Google or not. The Spam Score metric from Moz. See the Trust & Citation Flow for each backlink. MozRank to indicate the popularity of the site linking. The Moz metrics that indicate how authoriative is the site that sends a backlink. Quickly see the domain extension for each backlink. Identify links from sites hosted on unfamiliar locations and quickly discover blog networks. Discover how many backlinks your site has from the same hosting IP. The number of social media signals for each link. The number of social shares on social media for each link. How many external links does the page that sends a backlink has. See in a glance if the backlink has sent traffic to your site. Protect Your Site From Negative SEO Now!